Her name is Barbara Millicent Roberts and she lives in Willow, Wisconsin USA. She was born on March 09, 1959 to her parents George and Margaret Roberts, Skipper and Tutti are her sisters and Todd is Tutti's twin. Best friends are Midge Hadley and boyfriend Ken Carson. Only about 350,000 of the first Barbie dolls were produced, the Barbie doll is made of heavy vinyl plastic, partially solid body now probably quite white, blonde or brunette saran ponytail hair (Blonde's out number Brunettes 3:1), curly bangs, metal cylinders in legs, symmetrical holes in feet bottoms that fit on to a black pedestal stand, right foot marked: JAPAN, white irises, side glancing eyes, pointy ^ ^ eyebrows like lightening bolts, some of the early Barbie dolls have hand painted faces, others were stenciled, red painted closed mouth, No marking on back of head, one piece black and white zebra striped swimsuit, black open toe heeled shoes with holes on the bottom for stand, white sunglasses with blue lenses, gold tone hoop earrings, black pedestal stand with prongs, cardboard box has ™ in the marking and a pink booklet with only Barbie on the cover. 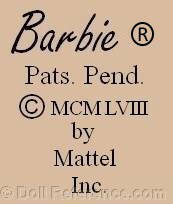 Number One Barbie 1959 marking: Barbie ™ Pats. Pend. © MCMLVIII by Mattel Inc. Values for number 1 Barbie dolls with the holes on feet bottoms and lightening bolt eye brows are usually in the thousands of dollars, the better the condition of the doll, having all her original accessories will command the highest value. Same as Barbie doll number one, but no holes in feet or cylinders in legs, new disc pedestal stand with black wire that fits under the dolls arms, same black and white stripe swimsuit, white sunglasses with blue lenses, black open toe heeled shoes, some came with new pearl earrings, pedestal stand, box has new ® in the trademark, and a Barbie booklet. Doll mark Barbie ™ Pats. Pend. © MCMLVIII by Mattel Inc. 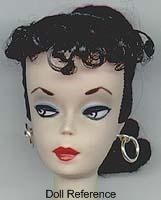 Similar to Barbie number two doll, with new blue irises, new softer curve to eyebrows some dolls with brown or blue eyeliner, same black and white stripe swimsuit, white sunglasses with blue lenses, black open toe heeled shoes, some came with new pearl earrings, pedestal stand, cardboard box, and a Barbie booklet. 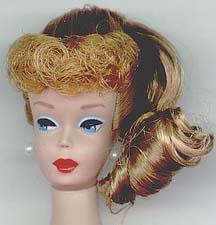 This number two Barbie doll has also been reproduced by Mattel and the neck rim should have a marking. 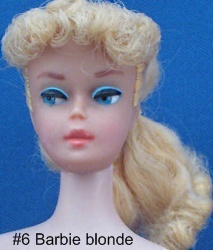 New type of plastic retains flesh color, came in blue eyeliner only, rest same as the number three doll including she wore a black and white swimsuit and same accessories were included. Doll mark: Barbie ™ Pats. Pend. © MCMLVIII by Mattel Inc. NOTE: This is the last early Barbie with the Barbie ™ in the marking. 1961 and newer the mark changed to Barbie ®. New hard hollow torso, new hair color of titian (auburn), plus blonde and brunette, a little firmer texture to the hair, some have the old soft hair and some have a combination, the number five doll face may have the greasy, shiny face syndrome, some do not, came wearing a black and white striped swimsuit, new black all wire stand, pink booklet with Barbie and Ken on cover, rest same as the number four doll and accessories - see new marking. 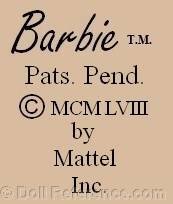 Doll mark: Barbie ® Pats. Pend. 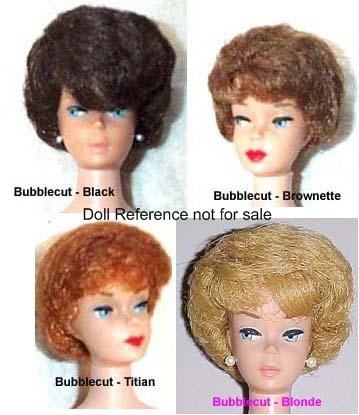 © MCMLVIII by Mattel Inc.
New bubblecut hairstyle, new titian (red or auburn) hair color, blonde, brownette (this is the lighter brown or sable color only sold at Sears), and brunette almost black color, rest same as 5 and 6 ponytail. Lip and nail colors vary from red to pale bubblegum pink. 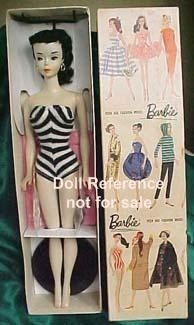 The Brownette hair color is rarer than the other hair colors and therefore commands a higher value, she wore a black and white striped swimsuit in 1961 only just like the earlier ponytails, same accessories as prior ponytail Barbie dolls. New red one piece helenca swimsuit, various lip and nail colors, new undated box (see box in ponytail 1962), rest same as the 1961 bubblecut. Slightly taller body, rest same as 1962, new markings of Midge and Barbie. 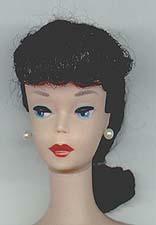 New doll mark: Midge T. M. © 1962 Barbie ® © 1958 by Mattel, Inc. 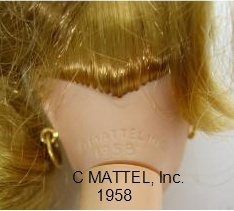 Same as 1963 bubblecut doll marking with the word "patented" added to the last line of marking. #7 - Ponytail Barbie dolls 1963 - New doll mark: Midge T. M. © 1962 Barbie ® © 1958 by Mattel, Inc. just like the bubblecut dolls in 1963. The box graphics are the same as prior doll, but box is now dated © 1962. Same accessories as prior doll. #8 - Same as the 1963 doll mark with the word "patented" added to the last line of the marking.